Calling all turkeynecks, dirt fiends and juiceheads! Often imitated, never equalled - the legendary, the one-and-only, the unique LAS VEGAS GRIND hath finally returned! After many years scouring the greasy basement dives of the netherworld, we finally managed to locate the manic mastermind responsible for the original six volumes of deviant, demented & depraved sleazeball bump and grind. Slumped at the end of a bar, we struck the deal at midnight as we drank a toast of cold ratpiss, and with deep regret we at Jazzman can now unveil the latest in the whole sorry saga! And so, dragged under the strippers' spotlight for the first time in 60 years, long-forgotten never-knowns by Alonzo & the Boppers and The Abstracts rock side-by-side with lurid low-life lurchers Louie & the Fat Men and The Escorts. Little Louie & the Finger Cymbals rattle their tiny pasties while Gay Poppa's Cha Cha flips us round and takes us to the other side. All in all yet another set of crude and tasteless chudlocker choons bound to upset the whole square world all over again. 16 gruesome growlers guaranteed to torment and tease. Shameless and shocking; rotten to the core - welcome, welcome at last to LAS VEGAS GRIND 7. 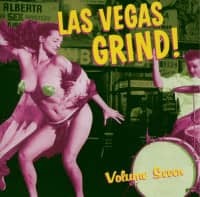 Customer evaluation for "Las Vegas Grind Vol.7 (CD)"